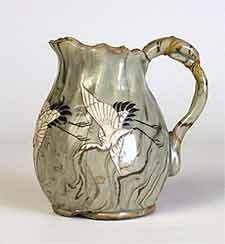 Banko jug - 3¼" (82 mm) high. The original Banko pottery is said to have started in the mid-seventeenth century in the province of Ise, Japan. It had long since ceased to exist when in the mid-nineteenth century Mori Yusetsu bought the rights to produce pottery in the same area using the original potter's seal. Today, the Banko Ceramic Industry Association is flourishing, and exports to most parts of the world.